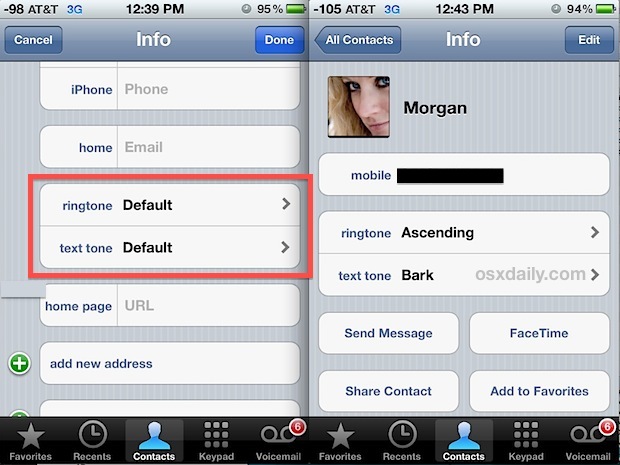 You can make your iPhone life a lot easier by assigning custom ringtones to contacts. This makes it easy to determine who’s calling before you even see the caller ID, letting you either rush to answer the phone or continue snoozing and ignore the call. With how easy it is to make ringtones for the iPhone, it also provides a great way to differentiate inbound calls from the common ringtones you hear elsewhere too. Assigning a completely unique tone to each contact is generally too time consuming, but a happy medium is setting unique tones to people on your favorites lists. Now anytime you get an incoming phone call from the users with custom ringtones set, you’ll know by the sound alone. It’s also a great strategy to field incoming calls from people you don’t want to hear from, and it works for everyone so long as they are not blocking their caller ID. From the same Contacts editing field you can also set a custom text tone for each contact, and you can even make your own versions of those too. I use this approach for incoming SMS as well. When I login to my e-banking, my bank sends me a text message. As I expect this message anyway, I don’t need a text tone. As a surplus, People around me will not be disturbed. This required that I added the special SMS numbers from the banks to my address book and setting the text tone to none. Helpful additional tip to this mix: create a silent ringtone (empty m4r file) and set that to people you want to always be silent when calling you! « Huge Discounts on SSD Upgrades: 120GB for $80, 240GB for $155, 480GB for $350 – Today Only from Amazon!